READ BEFORE PURCHASING __ INSTRUCTIONS __ After you purchase the one-time JPAQ assessment through Paypal, allow the Paypal payment page to load, then scroll down until you see a gray box with the words “RETURN TO MERCHANT.” Click that link to return directly into the online JPAQ assessment. If you do not take this step, there is no other way for you to access the exam. We will refund you and you attempt again. To learn more, scroll down and read about this online personality questionnaire. 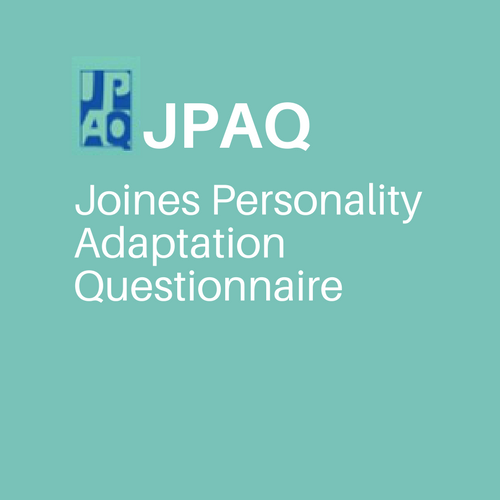 Welcome to the online version of the Joines Personality Adaptations Questionnaire (“the JPAQ” as we like to call it) — an online personality questionnaire. This strength-based view of personality types offers insight into who you are and why you are doing what you are doing. When you purchase a one-time online administration of the JPAQ, you will discover your unique combination of the six Personality Adaptations. The six adaptations are: Creative-Daydreamer; Charming-Manipulator; Brilliant-Skeptic; Playful-Resistor; Responsible-Workaholic; and Enthusiastic-Overreactor. With this purchase, you will receive detailed information about how you best connect with other people (through thinking, doing, or feeling). You will also gain insight into how your early parenting shaped who you are today and what you can do to enhance that! Interested in learning more about the JPAQ? Join us for a two-day training workshop! If you are a clinician and would like to administer the JPAQ personality adaptations questionnaire we offer both an online and a paper version. Check out our store for more information!